Tackling big challenges in unreliable conditions is something people usually shy away from. There is a sense of doubt in the form of a dark cloud that lurks around the idea of trying. Dispelling this emotion is a challenge in its own right, simply because the odds are visually stacked in favor of failure. However, there are individuals who rise above this dark cloud of uncertainty on a daily basis that inspire bravery in the rest of us. Rhyan Loos is one such individual. She has been battling Stage IV Neuroblastoma for two years, and with the support of her loving family and friends, this brave 7 year old from Missouri is still rising to the challenge of beating cancer, Every. Single. Day. Rhyan is who inspired my friend Paul and I to tackle New Hampshire’s Presidential Traverse, in order to help raise funds and awareness for her cause. With this objective in mind, we pushed through 16 hours of crags, snow, and unpredictable weather swings to complete the 23 mile traverse. For those who are thinking about doing something similar, we’ve picked three important elements to consider before venturing out. Participating in any kind of mountain sport between seasons presents a multitude of obstacles that not only require additional gear, but also additional skills to call upon at a moment’s notice. The terrain itself illustrates how occurrences, such as fluctuating temperatures, can bring out characteristics of the summer and winter months simultaneously. Not only is slippery and unstable crag a consistent obstacle, but ice and snow is still part of the equation, making travel conditions extremely hazardous. Snow-spikes and trekking poles may do the job in some cases, however a sudden drop in temperature may mean that use of crampons and an ice axe are necessary to safely adapt to the newly frozen, steep terrain. Conversely, if the temperature jumps, the snow drifts along the way may require use of snowshoes to avoid post-holing. Experiencing changes of this sort without the ability to adapt can lead to dire consequences, however, researching logistics, understanding the risks, and undergoing skill-specific training before hand, are key in determining the best ways to prepare. Mountain weather has a reputation for being wild and unpredictable. 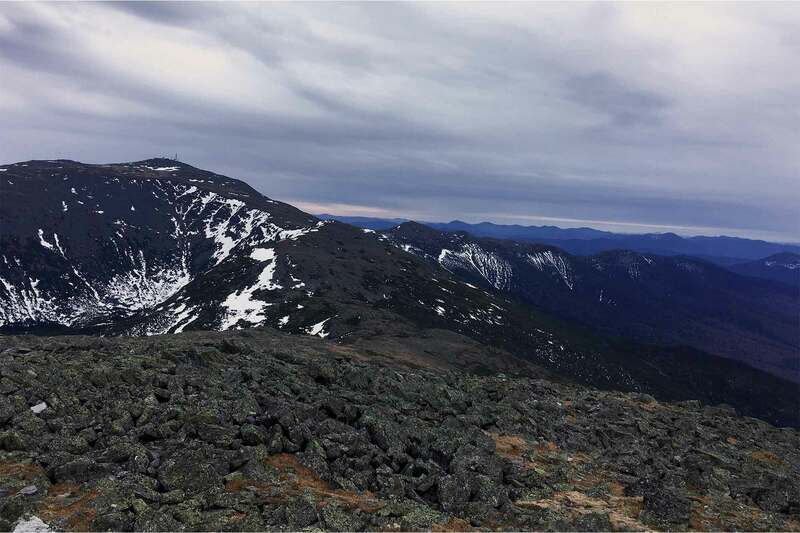 For example, on the day of the Presidential Traverse, the forecast predicted a chance of showers in the late afternoon with clear skies throughout the day. This sounded great, but by 11:00am, clouds had covered the clear blue sky and it began to hail, which didn’t bode well. The hail eventually turned into scattered showers throughout the day, and by sunset, wind speeds had begun climbing to 50 mph. Although it is important to monitor the weather, keep in mind that it is never a guarantee. Encountering inclement weather should be expected and proper precautions should be observed in order to help maintain safety margins. Establish bail out points prior to setting out, and remain diligent throughout the day and in case conditions become too unsafe to continue. Photo credit: Paul J. Plumeri, Jr.
Now that we’ve covered the doom and gloom portion of this article, there are benefits that come along with tackling big challenges in unfavorable conditions. Witnessing the landscape undergo an awesome transformation over many hours is something that sunshine-hikers will not get to experience, until you decide to share the pictures you took along the way, that is. Many varieties of hue and texture are hidden among the seemingly monotone rocks, which are only revealed when wet, especially in the alpine zone where colorful moss and small brush plants sprout from the crags and boulders. Cloud formations help to create contrasts with a dark landscape, or a body of still water. They also make excellent time lapses as they cascade through the peaks and valleys like a river, putting a positive spin on getting socked in. For photographers and camera enthusiasts with a creative flair, this could be a great opportunity to get away from capturing yet another mountain sunset and unleash your inner Turner. Melting snow and ice collects in the valleys, forming beautiful ponds that shimmer in the sun, or freeze over at night. Some of these creeks and ponds only form in the spring, and are gone by summer. It's best not to miss out! Whether you’re a day-hiker or mountaineer, the biggest take-away of tackling big challenges in unfavorable conditions is knowing full well what to expect beforehand. Be sure to prepare by bringing season-appropriate gear, identifying bail-out points, and monitoring weather patterns accordingly. Research and training are also important components of the strategy which will increase the margin of success, while decreasing the margin of risk.